Today includes the birth of a Strachan whose son migrated and was one of the founders of a major Canadian company, and two siblings with the same birthday who both died in infancy. Baptism of Sarah Green at Worsbrough, Yorkshire, daughter of my ggggg grandparents Joseph Green, linen bleacher, and Alice Rock. 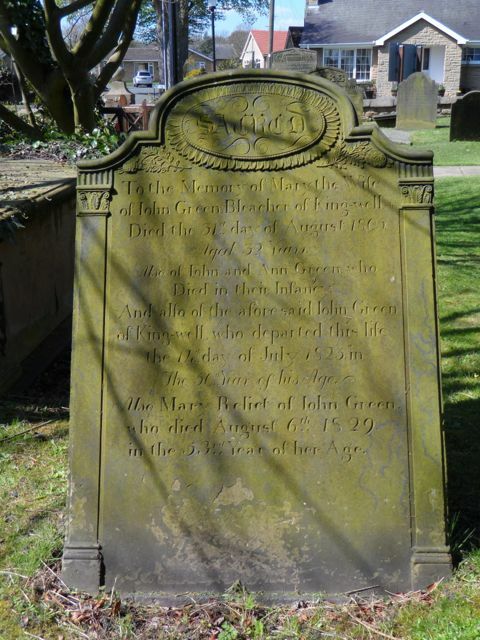 Not sure what happened to her, but she could be the Sarah Green who married John Binns in Silkstone in 1793. Or not. Baptism of Elizabeth Oxley at Barnsley, Yorkshire, daughter of my ggg grandparents Thomas Oxley, labourer, and Sarah Grist. As Sarah the disappears from the records, I assume she died before 1841. Birth of Henry Strachan in Kilmarnock, son of John Francis Strachan and Jean Johnston Loudon, making him the grandson of my ggg uncle Thomas Strachan. I’m assuming Henry died in infancy as he’s not in the 1851 census with the rest of his family. Birth of James Strachan, younger brother of the above Henry, and who also died in infancy. Rare to find two siblings with the same birthday but sad they both died at such a young age. Herewith photos taken at Worsbrough during my trip there on Thursday. Memorial gravestone for my ggggg uncle John Green, a bleacher, and his two wives, both called Mary, plus two children who died in infancy. 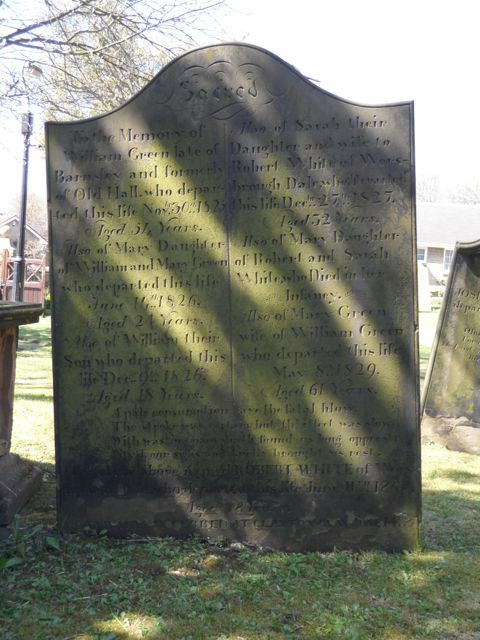 An old transcript of memorial stones has one for my gggg grandfather Joseph Green but it has since either been removed or become illegible: I’ll go back one day and have a good hunt round to see if there’s any trace of it. Memorial gravestone for William Green and his family. He is surely related to my Green ancestors but at the moment I’m not sure how. 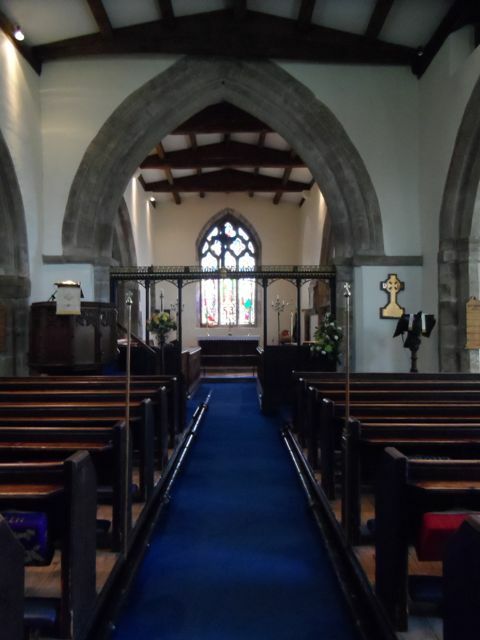 The inside of St Mary’s church, which is a very fine country church. 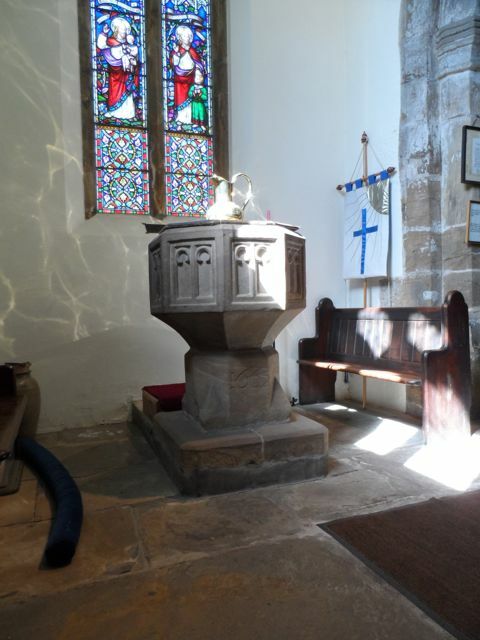 The baptismal font inside St Mary’s, dating from 1663. 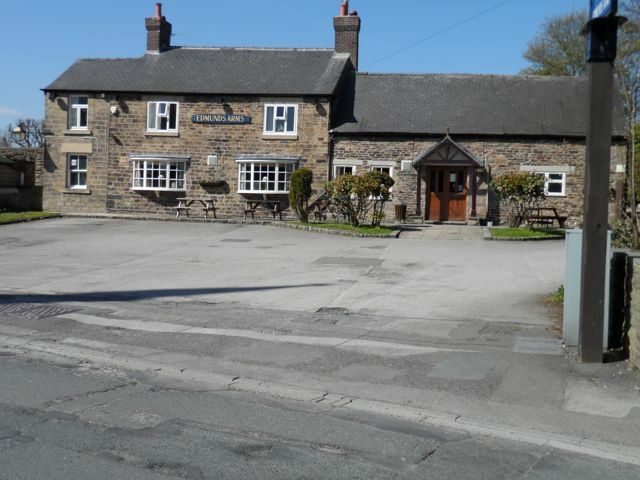 The Edmunds Arms, opposite St Mary’s, which used to be a coaching inn back in the day of the toll roads – Worsbrough was on the road between Sheffield and Barnsley. The original inn building is the part that now has two bow windows. A big thank you goes to my second cousin Robert Green, and the gorgeous Ted the terrior, for taking me around Worsbrough and Barnsley on a conducted tour of our Green ancestors’ stomping grounds. Worsbrough contains some very beautiful spots and has the most fantastic views south.But it has to be admitted that industrialisation, and in particular coal mining, didn’t do the Barnsley any favours from an aesthetic point of view, nor did 1960s architecture, but back in the day when the Greens were busy running coaching inns on the old toll roads and working in the linen bleaching fields, Worsbrough must have been a very pretty place indeed. Some lovely old architecture has survived, though sadly not all the old coaching inns. The church of St Mary’s in Worsbrough village (opposite the Edmunds Arms) is a particularly fine example of a very old Norman country church, expanded over the centuries since but still small and perfectly formed, so I’m hoping the photos I took turn out well and I can post them here. I also took photos of two Green family gravestones in the churchyard, which contained some detail I wasn’t aware of, so I’m thrilled to have had access to them. Thanks to the M1 the journey from Leeds to Barnsley takes no time at all, so I will be certainly visiting again. I’ve started typing up my notes about Robert Strachan born about 1808, my gg grandfather, his two wives, and his (gulp) 15 children. Given the size of the family this won’t be completed overnight, but will be here shortly. I thought I’d try and get as much Strachan information up as I can now that my Canadian relatives are following this blog. However, I’ll be going down to Barnsley to walk in the footsteps of my Green ancestors later this week, and will be taking my camera, so shall try and do a photo story when I get back: lots of old coaching inn will no doubt be featured. Genealogy: a bad weather interest? I’m aware I’ve done very little with my genealogy notes for well over a week, and there’s a good reason. It’s spring at last and the weather has been dry and fine, so my time has been taken up with gardening, horse riding, helping out at the rescue centre and just getting outside and enjoying the feel of fresh air. Which has made me wonder who else does a lot more online research, note sorting and reading when it’s wet and cold outside. The only reason I’m inside this afternoon is it’s started raining! These days, there’s so much that can be done from the comfort of your own home, close to a kettle for those frequently needed cups of tea. (Stopping for a cuppa is a great way to gather thoughts and idea, I find.) It’s a brilliant way to spend a cold and wet winter day. However, I’m hoping for fine weather towards the end of next week as I’m off down to Barnsley to meet up with a second cousin and fellow genealogist to be shown around my Green family haunts, which happily means doing a bit of a pub crawl as they were innkeepers. It’ll be good to get out and about again instead of sitting in front of a computer screen. It’s also spurred me on to start planning in earnest for my summer trip to Scotland. I’ve not been up there for ages, and the last time I went was in the middle of winter, so I can’t wait too see my ancestors’ places in (hopefully) fine weather. Not much today, but two events involved early 20th century migration to Canada and USA. Baptism of Betty Green at Worsbrough, Yorkshire. She was the daughter of my ggggg uncle John Green, a bleacher, who married Mary Addey. Margaret Milne sailed from Glasgow to Canada and settled in Vancouver. She was the granddaughter of my ggg aunt Janet (also Jessie) Fraser, and had been born in Cruden, Aberdeenshire. She married George Birnie in Vancouver in 1922. Jessie Lydia Michael married Robert Moore at Manhattan, USA. She was born in Cruden, Aberdeenshire, the daughter of my gg aunt Mary Ann Fraser and husband David Ewan Michael and had migrated in 1929. In 1930 she was working as a servant for a banker and his family, as was her older brother.